The famous young wizard returns to Hogwarts for a second year of schooling, and you'd better believe that he's got adventure in store for him. It seems that the students are one by one turning to stone, and it's up to Harry, Hermione Granger, and Ron Weasley to figure out the cause. 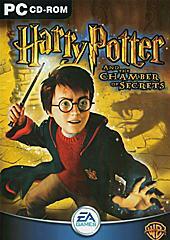 Enjoy breathtaking graphics as you explore Hogwarts, the Forbidden Forest, and Diagon Alley. Defeating your enemies won't be possible unless you pay very careful attention in your magic classes and master a series of mini-games that are designed to test your knowledge and skills. Go deeper into Harry's world - explore rich environments from the Great Hall to the dark reaches of the Forbidden Forest. Take the flying car to Hogwarts and master new second-year spells, including Skurge, Diffindo, and Spongify. Overcome dangerous foes from Aragog to the deadly basilisk. Test your skills in Quidditch and Wizard Duel leagues. Interact with new characters from the Chamber of Secrets, including Dobby, Lockhart, and Ginny Weasley.